In September of 2016, Miltenyi Biotec started to offer flow cytometry antibodies in a concentrated format of 2 μL of antibody per test*. Due to an increasing demand for smaller pipetting volumes for multicolor panels with many antibodies, we are glad to introduce the change from a 10 μL of antibody/test to a 2 μL of antibody/test format for many of our antibodies. The change will be accompanied by a change from 5 mL amber glass bottles to 2 mL polypropylene vials, which will be marked with color-coded labels for easy identification and organization of your flow reagent inventory. From September 2016 onwards, all newly released products are available in this concentrated format. All existing products available in the 10 μL of antibody/test format will continue to be offered for sale until inventories are depleted. Upon new inventory manufacture, you will begin receiving products provided in the more concentrated, 2 μL of antibody/test format. Be sure to check the up-to-date datasheet to confirm the correct volume per test. *One test corresponds to labeling of up to 106 cells in a total volume of 100 μL. Our 2 mL vial format provides you with highly concentrated antibodies. This requires you to only use 2 μL of antibody volume per test, which means more flexibility and more antibody specificities per test, allowing you to expand your multicolor panels. A pipetting volume of 2 μL per test reduces the total antibody volume in a multicolor staining mix. This allows that even in multicolor panels with up to 25 antibodies, the total antibody volume does not exceed 50% of the total staining volume. Color-coding means easy identification and organization of your reagents. 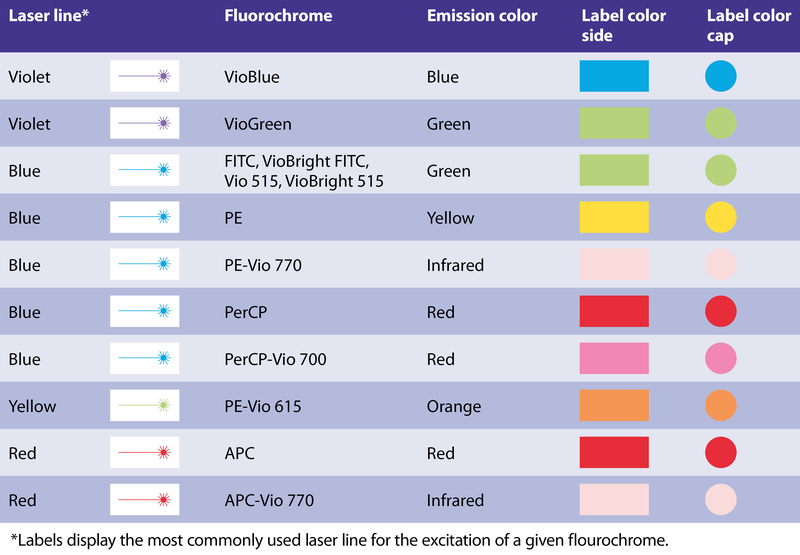 Organize your flow reagent inventory according to the emission color of conjugates, the laser used for excitation of fluorochromes, and/or according to the name of the antigen. 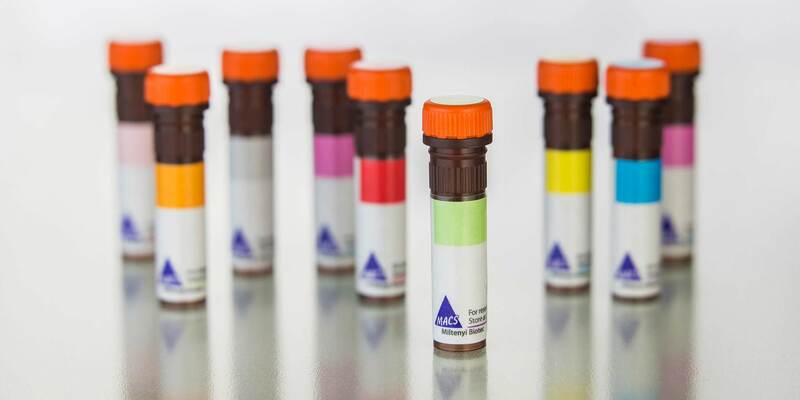 The color-coded labels of our 2 mL polypropylene vials indicate the color closest to the emission color of different conjugates and the corresponding laser excitation color. In addition, all 2 mL vials have bright orange caps with colored labels that conveniently correspond to the emission color of the conjugate. In order to provide you with convenient choices for setting-up your large scale and high-throughput experiments, we are introducing bulk-sized options for selected products. For additional large-scale sizes and available discounts for our products visit Custom Antibody Design Services. How will I identify that my product is now available in the 2 μL of antibody/test format? 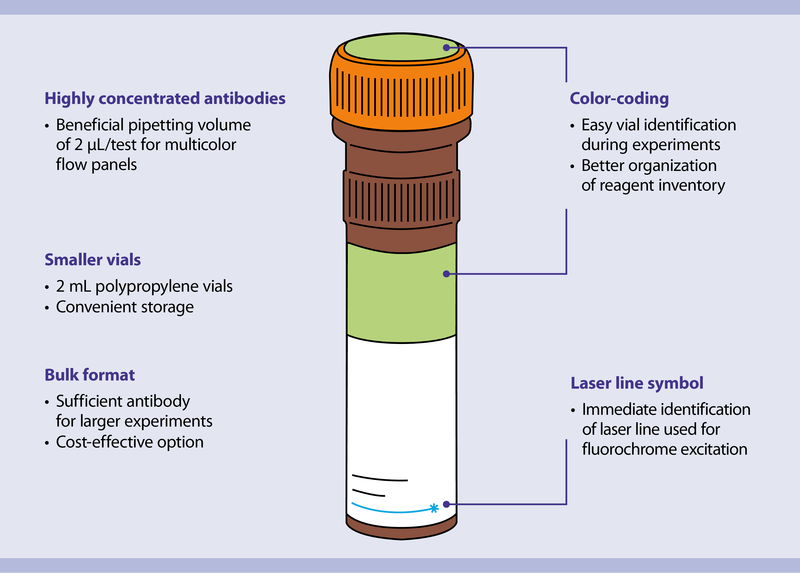 All MACS Antibodies available in the 2 μL of antibody/test format will be available in 2 mL polypropylene vials with color-coded labels. In addition, the recommended volume of antibody per test will be indicated in the datasheet. Be sure to check the up to date datasheet to confirm the correct volume per test. How does the new pipetting volume of antibody per test influence my current staining protocol? The only change in our staining protocols for all MACS Antibodies provided in the 2 uL of antibody/test format is the volume of antibody added per test. All other staining steps and incubation times with MACS Antibodies remain the same as currently described in our protocols. I am already using MACS Antibodies that are 10 μL of antibody/test. Will my product still be available in this format? All existing products available in the 10 μL of antibody/test format will continue to be offered for sale until inventories are depleted. Upon new inventory manufacture, you will begin receiving products provided in the more concentrated, 2 μL of antibody/test format. Be sure to check the up-to-date datasheet to confirm the correct volume per test. All existing products that will be introduced in the 2 uL of antibody/test format, will receive new order numbers. Once the stock of existing reagent is depleted and you place orders using order numbers for products of the old format, the order will be automatically redirected to organize a shipment of the corresponding product in the new format.